Looking for fine accommodations in the Ingonish Cape Breton area? Situated at Ingonish Ferry, the Castle Rock Country Inn is a four-star, boutique hotel overlooking the magnificent vista of Middle Head Peninsula, the Atlantic Ocean and the mountain range of the Cape Breton Highlands. An ideal location for day trips to all other points of interest on Cape Breton Island. Our fine accommodations include 2 bedroom log chalet/cottages, 3 bedroom chalet and log motel suites. Access to a beautiful sandy beach is just across the road and down a pleasant 3 minute stroll through a wooded path. Nestled between two mountains, the view is magnificent with cottages overlooking the harbour and ocean! Only minutes from the Cape Breton Highlands National Park, our location is perfect to enjoy all the activities that the Ingonish area is famous for. Steps away from the Atlantic Ocean in Ingonish on a six acre private beachfront property stands Lantern Hill & Hollow-beautifully landscaped grounds, large expanses of green, manicured lawns and a welcoming guest house perched majestically on the hill-top; the house reigns over a charming seaside village of beach cottages nestled in the hollow below – and just a stone’s throw away from one of the most glorious stretches of wide, sandy beaches in all of Cape Breton. All of our accommodation rentals are located on the Cabot Trail, near or in Ingonish. Each Property has a unique water view with 2 or 3 bedrooms. 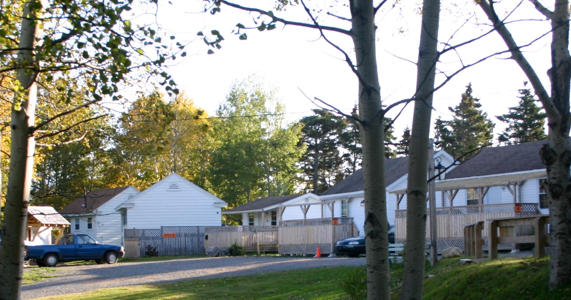 Rocky Bay Cottages are minutes away from everything you’ll need to have a great time during your vacation. This includes the hiking trails, Highlands Links Golf Course, beautiful sandy beaches and fun-filled boat tours. Each of the cottages at Rocky Bay have fully equipped kitchens and feature one or two bedrooms. Located on a spacious 2.5 acre lot, the cottages have a beautiful view of the Atlantic Ocean a sandy beach is within walking distance. Surrounded by Numerous Hiking Trails. 5 Miles from Ingonish Beach. there is a slice of paradise waiting for you! Whether you like to hike, bike, swim or relax, Neil’s Harbour has this and so much more to offer. Luxury accommodations on the famous Cabot Trail, Cape Breton! Our lodgings include luxury apartment suites, unique, fully equipped seaside cottages, HMS Sea Parrot (a 42′ Cape Islander boat on land), a private 2 bedroom oceanfront vacation home, and a private 40 foot RV with ocean view. From sandy beaches, lush green valleys and wild open barrens of Cape Breton we invite you to make Skyline Cabins your vacation destination and the starting point for your adventure into the Cape Breton Highlands. The area known as Ingonish is on the Cabot Trail, nestled between the National Park, Highlands and Atlantic Ocean. From start to finish the area covers only 16 kilometres, from the Skyline Cabins you are only minutes away from all recreation and services. Much of the Ingonish area borders the Cape Breton Highlands National Park which contains, look-offs, picnic sites, golf, beaches and hiking trails.